"Life is already fleeting. Why waste such precious time with war?" 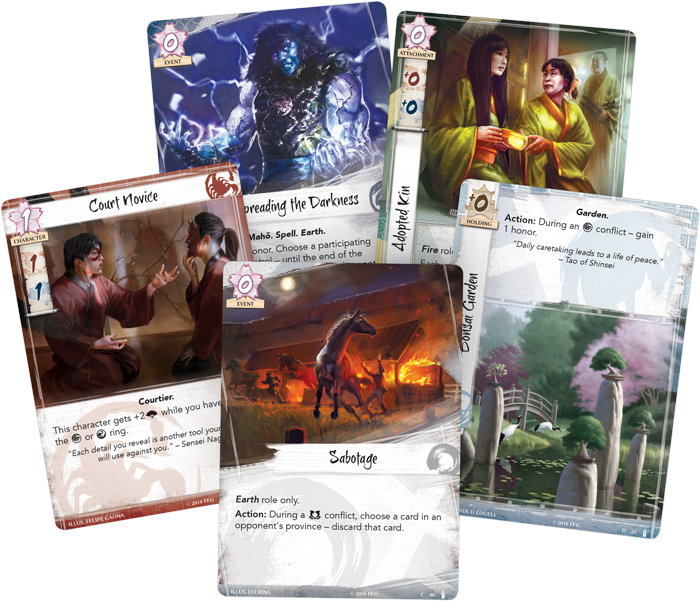 Tainted Lands, the second Dynasty Pack in the Elemental Cycle for Legend of the Five Rings: The Card Game, is available now from your local retailer or our website! Tainted Lands continues the themes found in the Elemental Cycle by introducing powerful Earth Spells and Shugenja, but it also features cards disconnected from this element. 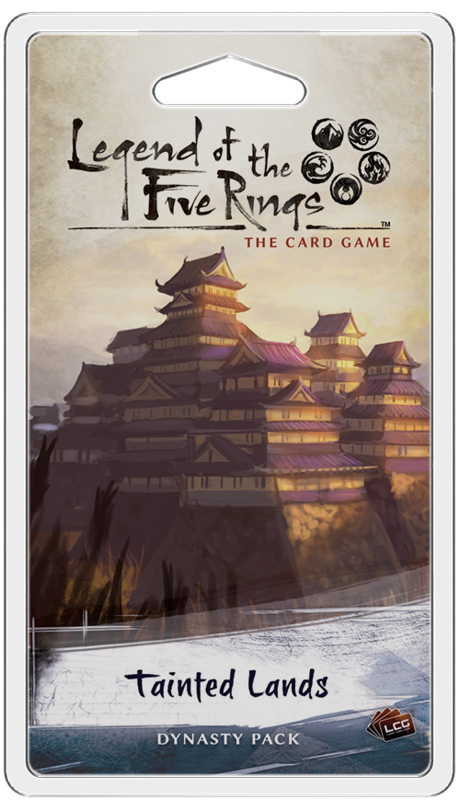 Here, you can look for three new, inexperienced samurai from three different clans, as well as two Crane cards focusing on the Air element. 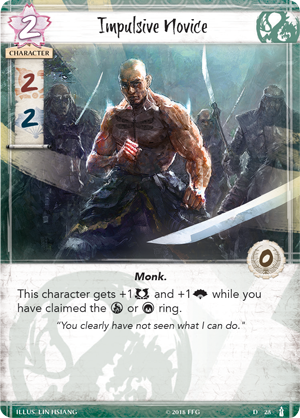 The Elemental Cycle introduces a cycle of inexperienced samurai. Novices and recruits, these characters lack efficient stats and have no glory, but they can become stronger if you claim specific rings. Every clan receives one of these characters in the Elemental Cycle, and three of them can be found in Tainted Lands. The Court Novice (Tainted Lands, 29) is inexperienced in the ways of the Scorpion, but with proper training can learn to become a master manipulator. One military and one political skill for one fate is not the best value, but when you have claimed the Air or Water Rings, the Court Novice gains two political skill and becomes a much more lucrative investment. 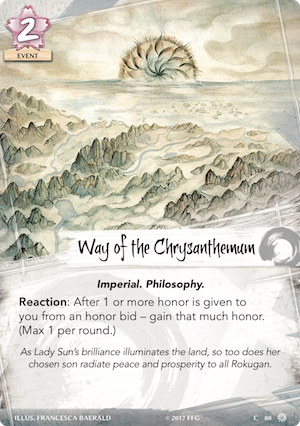 With the Scorpion’s affinity for the Air Ring to manipulate the honor on the field, the Court Novice can quickly get up to speed and learn to adeptly serve the interests of the Scorpion. While most of these inexperienced characters have one of their skills enhanced by claiming a ring, the Dragon find balance in all things. Instead of having a single skill enhanced by two, the Impulsive Novice (Tainted Lands, 28) sees both his military and political skill increased by one if you claim the Fire or Void Rings. On his own, the novice is already balanced, with two military and political skill, but if you can boost those numbers to three, the Impulsive Novice is a solid investment who can participate in any conflict. 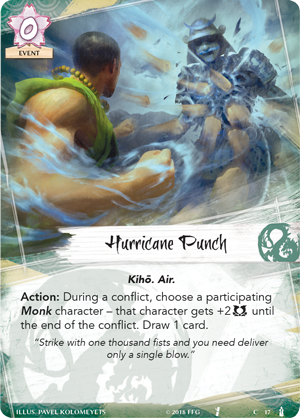 As a Monk, the novice also has access to cards like Hurricane Punch (Breath of the Kami,17) to further enhance his skills. The final inexperienced character in Tainted Lands is the Ikoma Reservist (Tainted Lands, 34), who increases her military skill when you have claimed the Fire or Water Rings. Like the Court Novice and the Impulsive Novice, the Ikoma Reservist becomes extremely valuable when you have claimed an appropriate ring, but she also includes an additional benefit. As a conflict character, the Ikoma Reservist can wait until just the right moment to enter the battle—preferably, after you have already claimed the Water or Fire Ring, guaranteeing you get the best value for the character. All risk is eliminated, and the Ikoma Reservist can enter the field at their full potential. These recruits and more await you in the Elemental Cycle, and though they may be inexperienced now, they represent the future of their clans. With proper training, they can become the samurai they are meant to be. While Tainted Lands focuses heavily on the element of Earth, the Crane cards found in the pack focuses on their element of choice: Air. 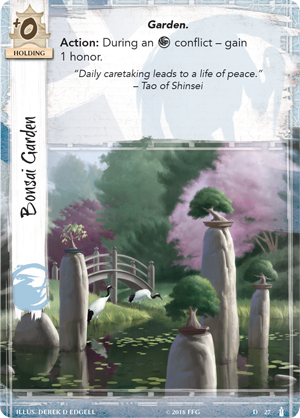 Bonsai Garden (Tainted Lands, 27) is a new holding that allows you, as an Action, to simply gain one honor during an Air conflict. It's well known that the Crane are experts at gaining honor, and they can accumulate an excess amount of the currency by simply waiting as their honored characters leave the field. Now, the Bonsai Garden gives them additional ways to gain honor for free during Air conflicts. 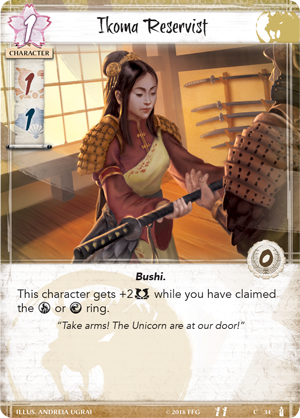 A deck focusing on Bonsai Garden, claiming the Air ring, honorable characters, and perhaps a Way of the Chrysanthemum (The Chrysanthemum Throne, 80) could potentially see the Crane winning via honor. The Crane also gain a new Shugenja in Tainted Lands. 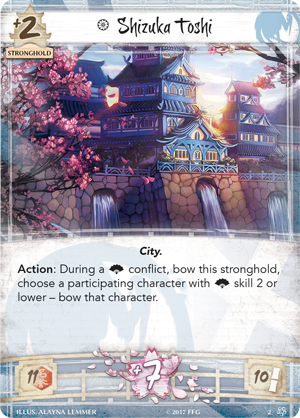 Asahina Takako (Tainted Lands, 26) can help protect your lands and keep your dynasty cards exactly where you want them to be. 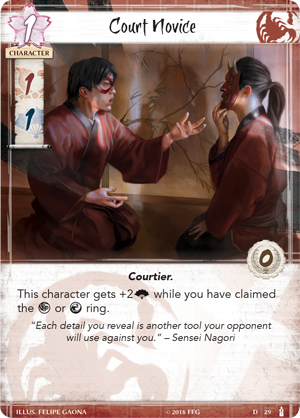 By allowing you to freely look at your facedown cards and switch or discard them as an Action, Asahina Takako opens up a new way of thinking about your dynasty cards—protecting your most precious resources and moving holdings freely. 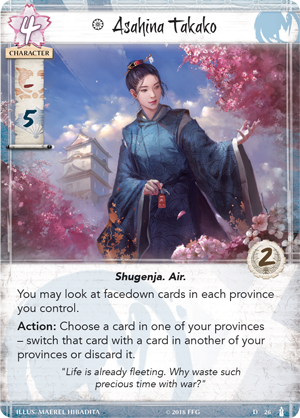 Furthermore, five political skill can easily tip a conflict to your side, and with Shizuka Toshi (Core Set, 2) on your side, the Crane can become nearly unstoppable during a political conflict. With war overtaking the clans of Rokugan, every samurai of the Great Clans must contribute to ensure not just the success of their clan, but its survival. While these samurai perform their duty, will it be enough to save Rokugan from the fury of the elements? Find out in Tainted Lands (L5C10), available now from your local retailer or our website!